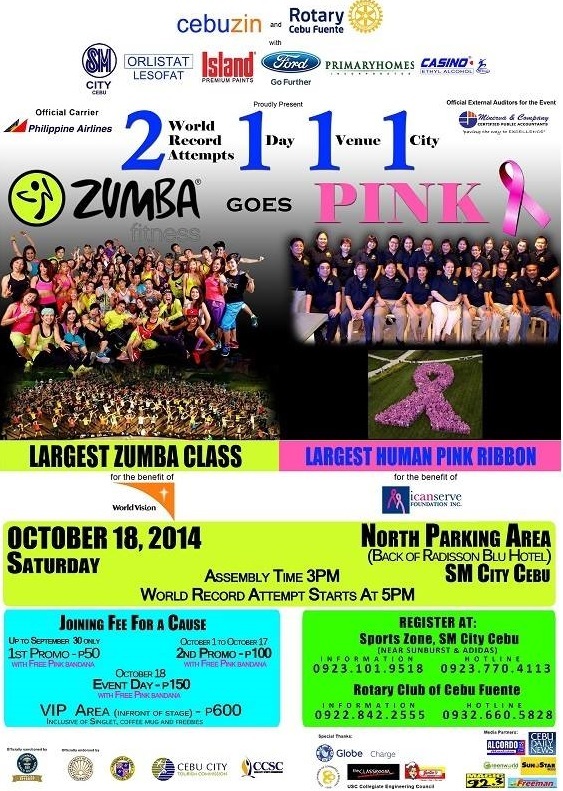 ICanServe Foundation Cebu Chapter members will join the attempt to break two Guinness World Records this Saturday, October 18. 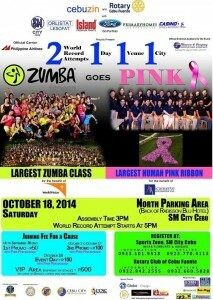 First is form the biggest human pink ribbon on October 18 at SM City Cebu. Second is to have the biggest Zumba class. The bandannas and numbered wristers will be given upon entry and upon presentation of their ticket. The event will be held at the North Parking Area of SM City Cebu. On-site registration costs P150 and VIP registration is P600. Assembly time is at 3 p.m. The attempt to break the world record will begin at 5 p.m.
GUINNESS is sending an adjudicator to certify if the attempt successfully broke previous GUINNESS RECORDS. The following day, Sunday, October 19, ICanServe Cebu Chapter supports the 8th Pink Run for breast cancer awareness at The Terraces in Ayala Center Cebu. 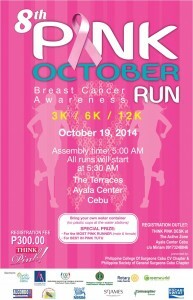 Registration is at P300 for all categories (3k, 6k and 12k). Assembly time is at 5:00 a.m. and gun-start is at 5:30 a.m. for all distances. The Pink Run is presented by the Philippine College of Surgeons-Cebu Eastern Visayas Chapter (PCS-CEV) and the Philippine Society of General Surgeons-Cebu Eastern Visayas Chapter (PSGS-CEV). 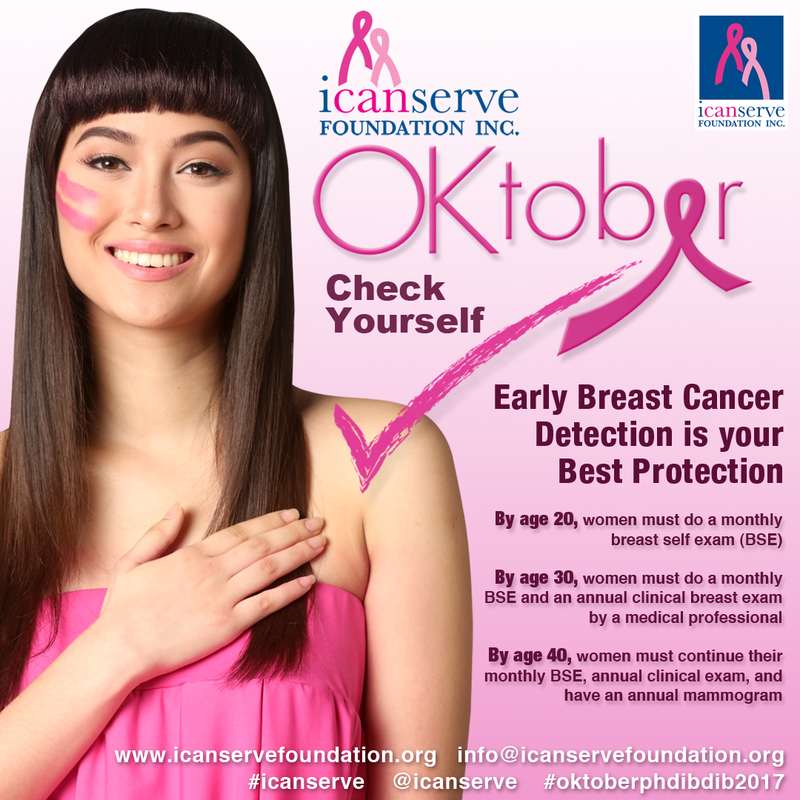 The ICanServe Foundation-Cebu Chapter collaborates with local institutions to promote early breast cancer detection, as well as help survivors tread the path to wellness. In 2014, fund-raising events are slated through partnerships with Ayala Center Cebu, SM City Cebu, Gelatissimo and the Department of Trade and Industry. For the third straight year, Gelatissimo (Australia’s most popular gelato) will support ICanServe. For every purchase of the Gelatissimo Think Pink bottled water (the one with a pink cap), P10 will be donated to ICanServe. Gelatissimo serves a range of low fat sundaes, coffee and smoothies. Ayala Center Cebu will donate proceeds of its Pink Expo and Ramp Diva projects, while SM City Cebu will donate proceeds of its Pink Barbie campaign to ICanServe. 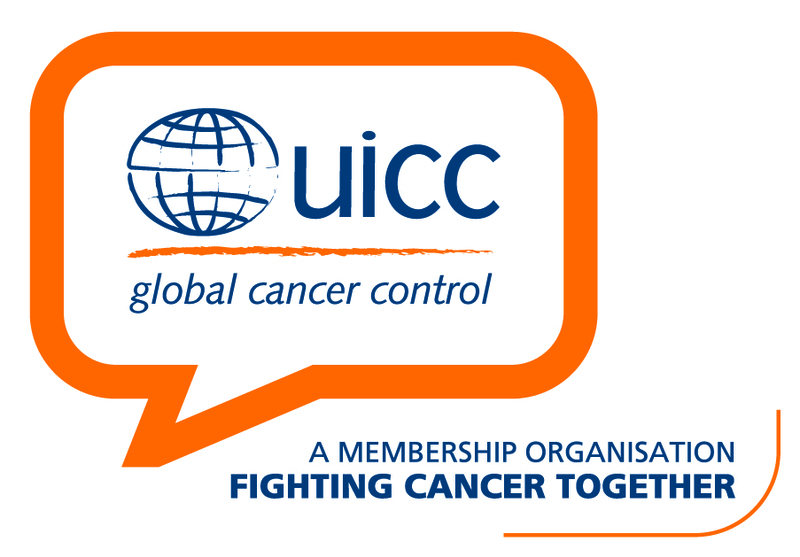 Standing to be counted as partners for advocacy are: PCS-CEV; PSGS-CEV; Eduardo J. Aboitiz Cancer Center (EJACC); Philippine Society of Medical Oncologists-Cebu Chapter; Rotary Club of Cebu Fuente; Clothes for Life; Cebu City; Cebu Province; Cebu City Tourism Commission; and various media organizations. SM City Cebu hosts a Pink Room, open on all Tuesdays and Thursdays of October from 3 to 6 p.m. for breast cancer screening by volunteer doctors from the PCS-CEV and the PSGS-CEV. The Philippine Society of Radiologists Cebu Chapter will conduct ultrasound for suspicious findings. Ayala Center Cebu conducted a Pink Clinic on October 11 and 12, where PCS-CEV and PSGS-CEV volunteers conducted breast cancer screening. Lay fora were also held cooperation with EJACC, PCS-CEV and PSGS-CEV. Since October 2011, the provincial capitol building of Cebu and other public buildings have been lighted pink to raise awareness of early breast cancer detection guidelines. This year, the Cebu City Rizal Library and the Fuente Osmena Fountain join the city’s “pinked” landmarks. If you are in Cebu this weekend, be part of history and join the journey to a new world record. Contact Me’Anne Solomon, 0917 320 6666, meannesolomon@gmail.com or Tingting Jamero, 0922 876 7674, tingjamero@gmail.com.